After hunting for a while this coyote finally disappeared into the brush. I thought that was the end of my observations for the day, but not so. Soon thereafter, two large men and their two large pit bulls appeared from a path close to where the coyote had disappeared. They proceeded down a trail which would lead them out of the park. The coyote then reappeared from the brush, sniffed where this walking group had lingered for a moment, caught sight of them, and then follow them, not too closely, but within eyesight, until they left the park. The dogs and walkers never turned around, so they never saw the coyote, and when they exited the park, the coyote disappeared again into the bushes close to the park’s exit. No one was any the wiser because of this. And that was the end of my observations of that coyote. Within 10 minutes, there appeared another coyote sniffing around where the first one had first caught whiff of the dogs. This coyote sniffed intently and looked all around, stretching his neck high, but no one was in sight, and maybe the scent of the dogs and the other coyote had begun to dissipate a little because he didn’t seem sure of which direction to follow. He finally made his choice. Instead of following the scent on the trail that led out of the park — the direction the others had gone in — he turned around and retraced the path the dogs had originally come from. I’m wondering: Did he lose the scent which led out of the park? Or did he mean to retrace the direction from which dogs and coyote had come? Was his interest a curiosity in the dogs or in meeting up with the first coyote? Or, might he have been attempting to assess if the dogs and coyote had had an encounter? We don’t actually know what pheromones and other clues were there for the second coyote to tap into. It’s always fun to try and figure out what these animals are up to! foraging in bushes after a skunk? As I spotted a coyote hunting, a gust of wind wafted a smell in front of me — I definitely smelled a skunk. Oh no, I thought, the coyote had found a skunk. But as I continued watching, I realized that the coyote was after a squirrel which evaded capture. I knew it was a squirrel because of the way the coyote soon kept looking up into a tree. But I got another whiff of that smell. I then thought that maybe it was the smell of a carcass — a capture from the previous night? But that idea evaporated because the coyote would have approached such a carcass, and I didn’t see him do so. Someone stopped to talk to me, and I lost track of the coyote. When the conversation ended, I decided to pick up where I had last seen the coyote on a path off in the distance. When I got there, there again was that stink. Ahh! I realized that this coyote must have been sprayed, and was carrying around a thick blanket of skunk perfume on itself, and leaving a trail of this odor behind as he passed through. I wondered if I myself might be capable of following the smell! Would it be possible for me to experience a sense of what it must be like to actually smell what I was looking for and follow it’s trail, in the exact same way as dogs and coyotes do? So, I became a coyote. I lost the odor in several places, but reconnected with it in others. Although the odor did not help me find the animal, it did allow me to know several places where it had been. And I did glimpse the coyote again at the end of the trail. After I participated in this little adventure, I felt somewhat “initiated” into a canine reality. Smelling for humans tends to be rather vague and not always “turned on”, but for canines it is intense and probably constant — it is one of their prime methods of gathering information. This coyote was hidden from view by some low lying bushes as dogs walked by on a path close by. The coyote sat perfectly still, so as not to be detected, except that he strained his neck and head up and out, and even closed his eyes to better whiff those passing by. Smells may relay much more than simply “who” individual dogs and people are, such as moods and various states of arousal, all of which produce their own sets of pheromones which the coyotes can smell and read from a distance in space and time. I’ve posted this behavior before, and am posting it again just to let everyone know how common it is. I’ve seen it often, I saw it again today. The coyote must have smelled the dead, dry snake from the path. The first photo shows the coyote sniffing. It went over to the edge of the path, where after a little bit of nose-work to move leaves and debris, it picked up the very stiff and dry dead snake. This snake was carried to the other side of the path where there were fewer twigs on the ground. It was dropped as the coyote grimaced disgustedly at the smell. It was carried a little further and then rolled on. The coyote then got up, making sure the snake was placed correctly — however that was — with its nose. And then the coyote rolled again on the snake, over and over. When the “rubdown” was finished, the snake was left there, and the coyote trotted off. Recently I’ve observed two incidents of a coyote using its strong sense of smell. In the first incident, the coyote appeared to be looking for something. This coyote trotted back and forth, looking around. Finally, it stuck its nose up high, as if reading the wind, and headed off to where the trees become thick. The coyote disappeared into this area for a few minutes, and then, TWO coyotes emerged! So the coyote had been looking for its friend! After finding him, the coyote waited for the other to come with him. Most domestic dogs have an extremely strong sense of smell, and a coyote’s appears to be stronger. I was told that part of the nose smelling system of these animals is really much closer to our human tongues: that the animals almost “lick” the air to pick up a scent that we humans would not be able to detect at all. I once sat about 70 feet off of a path in a wooded area where a number of dogs came to check me out — they could only have found me by smell. 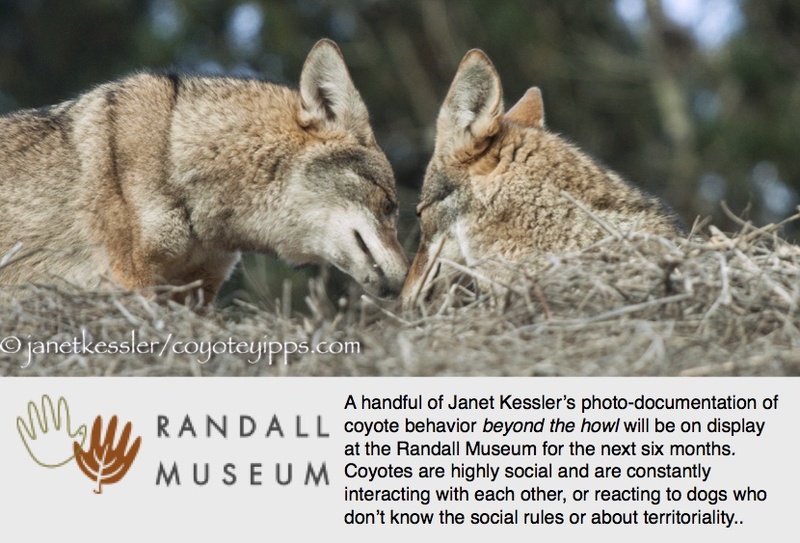 The first six photos belong to this first instance of a coyote using its sense of smell. The second incident was more interesting, and is depicted in the last nine photos. A coyote evaded a woman and her leashed dog coming down the path that the coyote was on by moving off the path about 30 feet into an area protected by bushes. The coyote did not hide — we all could see it; and the coyote kept its eyes glued on the dog and walker. After the walkers had moved on about 150 feet, the coyote came back to the path where it watched them walk off into the distance. Then the coyote proceeded to “sniff” the ground where the walkers had trod, as if seeing them walk by had not been enough — it needed to gather more information about them through smell. After a substantial amount of time doing this, the coyote walked in the opposite direction in which the walkers had gone. I’ve put in enough photographs to show how intently the coyote smelled the area. I wonder what kind of information the coyote was after? Possibly gender, reproductive status, dominance?? Or even if a “message” had been left for the coyote?? That a coyote might want to “perfume” itself by rolling on a smelly dead animal such as a snake, lizard or vole makes sense. If other animals can detect a coyote’s presence simply by its smell, masking its own smell with a much stronger odor would serve the coyote well by allowing him to parade around incognito as he goes about hunting! !